Hard Rock Hotel & Casino Las Vegas has partnered with the largest travel retailer in North America, Hudson Group, a wholly owned subsidiary of Dufry AG, to unveil six new exciting and energetic shops totaling 14,500 square feet and adding to the resort’s diverse retail and dining collection. The redeveloped retail spaces showcase high-end watches, timepieces and jewelry, travel essentials, electronics, wine, spirits and apparel. Design elements incorporate Hudson Group’s successful specialty and travel-essential concepts with a unique twist, showcasing eclectic features such as custom island vitrines, bright color schemes, hip décor and edgy textures for optimal guest engagement and visibility. In collaboration with architectural firm, Designwork Studios, Chill, Hootenanny and Dunkin’ Donuts are three modernized stores tailored to appeal to the guests’ senses and deliver an unparalleled shopping and dining experience, 24/7. • Chill by Hudson – The sundry shop, inspired by Hudson Group’s iconic Hudson News brand, offers 1,550 square feet of travel essentials ranging from books, magazines, snacks and beverages to travel and convenience necessities, tasteful local souvenirs and electronics. • Hootenanny by Hudson – Like Hudson Group’s modern Hudson brand, Hootenanny’s design is one that stands out. A modern apothecary meets old school roadhouse with raw, distressed fixtures and furnishings that have an industrial distillery feel. The 3,075-square-foot shop offers travel essentials, electronics, top-shelf liquor and premium cigars in a humidor. • Dunkin’ Donuts – A high-energy mash-up of bubblegum rock and pop art brings excitement to the iconic 1,546-square-foot coffee and baked goods eatery. The state-of-the-art restaurant can be found on the first floor of the hotel and is open 24-hours a day, seven days a week, serving Dunkin’ Donuts’ menu of delicious food and beverages, including its signature hot and iced coffees and world famous donuts. Leading, multi-dimensional brand experience and design firm, Big Red Rooster, has collaborated with retail shops Bezel, Day + Night and Shine to create their own identity and personality that offer a rock and roll vibe paired with an authentic shopping experience. • Bezel – Curated fixtures furnish the 831-square-foot high-end watch and timepiece store to amplify the craftsmanship and detailing of master watchmakers. Key brands include Hamilton, TAG Heuer, Ernst Benz and Raymond Weil. • Day + Night –Sophisticated opulence full of edgy attitude. The 7,111-square-foot apparel store covers shoppers’ leisure travel wardrobe needs from a sun-drenched day at the pool to a star-studded night on the town. Black and white, checkered tile flooring accentuates the juxtaposition between daywear and evening apparel with a large, open black ceiling and metallic gold drapery. Shoppers can find clothing, accessories and sunglasses brands including M. Fredric, johnnie-o, Hershel Supply Co., Maui Jim, Tom Ford, Gucci and many more. 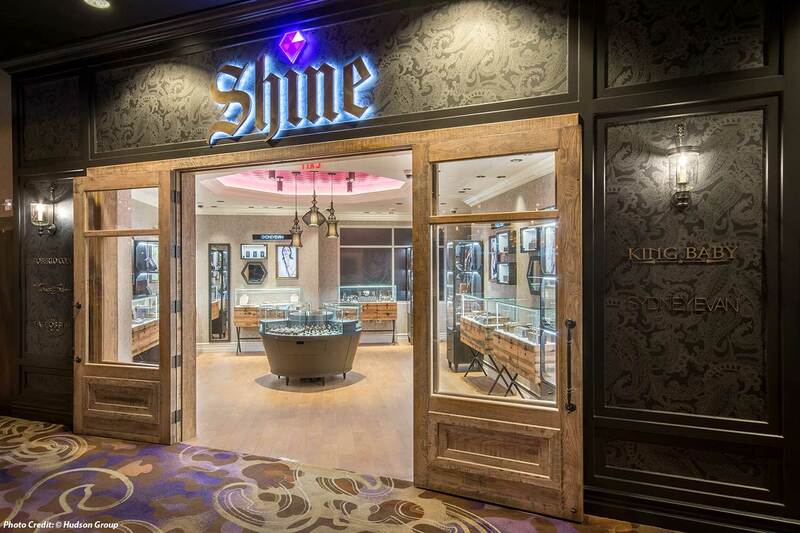 • Shine – Girly shimmer and shine is given a rock and roll edge in this high-end 400-square-foot chic jewelry store. Shoppers are treated by an intimate, boutique feel that is grounded in rustic reclaimed wood and modern detailing. Chill, Hootenanny, Dunkin’ Donuts, Bezel, Day + Night and Shine are now open. Hard Rock Hotel & Casino Unveils First Phase of $13 Million Refresh Inside Its Casino Tower!